The Academic Network will elect a Chair, Deputy Chair, Secretary, and an Advisory Board of 7 members for the operation and coordination of the Academic Network. As a group the Chair, Deputy Chair and Secretary constitute the Executive Committee. The Secretary serves as Secretariat for receiving membership applications, maintaining contact lists and distribution of business correspondence for the Executive Committee. Ideally the Chair, Deputy Chair and secretariat should each represent a different UN-GGIM region and/or type of institution, but the mix is dependent upon the open election process. The Advisory Board will be representative of the different UN-GGIM regions and gender balance will be considered as well. The Chair, Deputy Chair, Secretary and Advisory Board will serve for a two-year period, renewable once for an additional one year as determined by election. The Executive Committee will meet at least once a year. Candidates for Chair, Deputy Chair and Secretary may be nominated by any of the three officially listed delegates from any current member organization and only delegates from an existing member organization may be elected to serve as Chair, Deputy Chair or Secretary. After reviewing the documentation of all candidates, the lead delegate of current member organizations qualified to vote will receive an automated email sent to their official address asking them to rank vote all nominees for the position. An online ranked voting service utilizing the instantaneous runoff voting method and providing anonymity for voters will be used for the voting process, such as that provided at http://www.opavote.org/ or a similar system. Lead delegates will be given five days to cast their ranked votes. All voters receive the results of the election process from the system at the same time that the Secretariat receives the results. The Chair and the Deputy Chair make executive decisions regarding network management, coordination and membership application requirement issues. They shall review applications (EOIs) for individual institution memberships to ensure that minimum criteria have been addressed in each application prior to submitting the application for vote by the membership. A member may withdraw from the Academic Network upon informing the Chair or Secretariat with thirty days’ written notice. Such notice will be delivered electronically. If considered appropriate, the Academic Network will establish sub-regional groups in line with UN-GGIM regional committees and or task teams to focus on particular aspects of the programs under its oversight. The Network may meet at any UN-GGIM regional groups’ meetings. 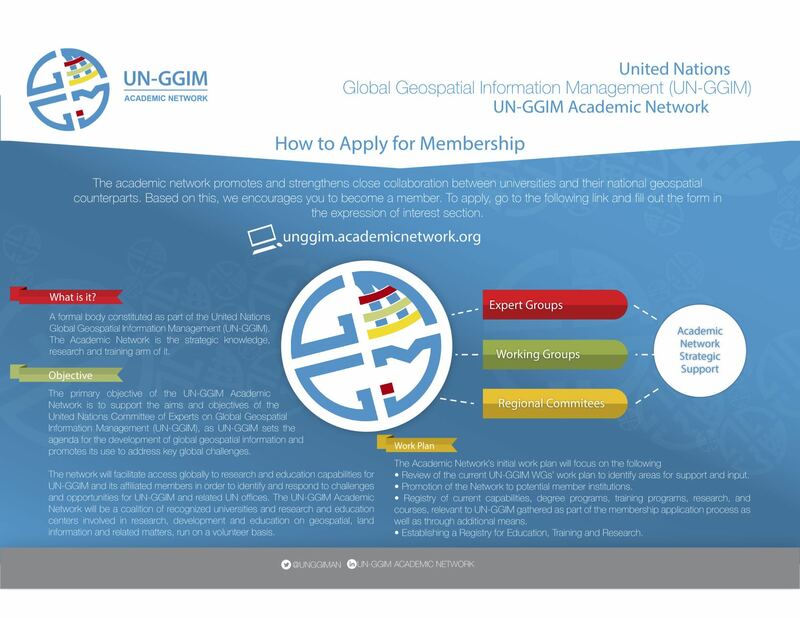 The Academic Network shall have one committee for each UN-GGIM Expert Group and Working Group. The chairs of these committees will be elected by the network members, with one vote per member cast by the lead delegate. As one of the responsibilities of membership, each Network member institution should have at least one delegate registered and actively participating in at least one committee. The Academic Network will liaise as required with other international academic groups and non-government organizations that may have an interest in the management of geospatial information to support the implementation of the Sustainable Development Goals. The Academic Network will review, and if appropriate revise, its Terms of Reference every two years, and in conjunction with a change in Chair and Deputy Chair. The Academic Network will meet regularly at the UN-GGIM Committee of Experts, High Level Forum, and any formal meetings.